The Look of Love – Be That Dog! 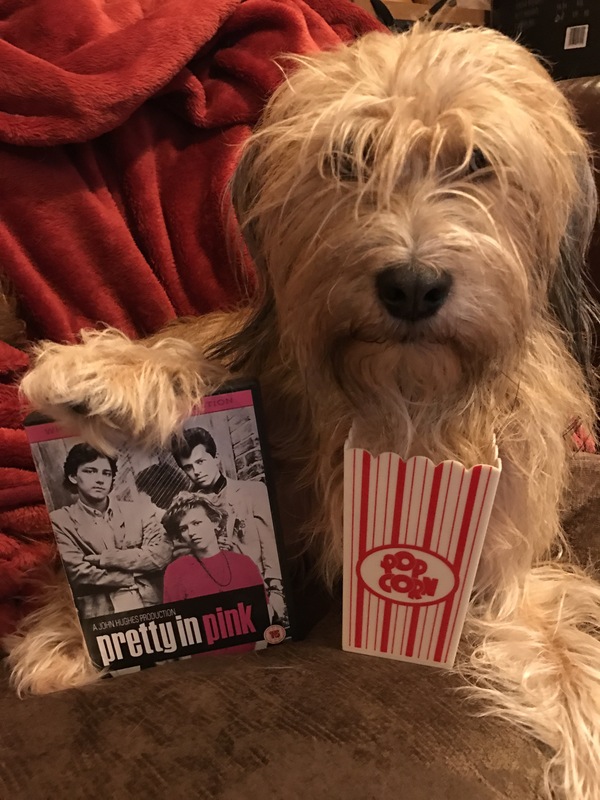 A review of Pretty in Pink, 1986, Howard Deutch (dir), starring Ace the Leonberger with Molly Ringwald, Andrew McCarthy, Jon Cryer, James Spader, and Harry Dean Stanton. One of the all-time favourite movies of this household is Pretty in Pink. This is a high school movie about social cliques, bullying, social exclusion, and the multitude of different loves of high school. You may think it sounds like the dog park. Indeed, it is one of the most accomplished dog park allegories in the history of cinema. Andie Walsh (Molly Ringwald) is a creative and intelligent girl from the “wrong side of the tracks” who lives with her dad (Harry Dean Stanton) after her mum abandoned them. Mr Walsh is depressed and struggling, and Andie is working hard to keep his head and heart above water. Andie’s best friend is the irrepressible Phil “Duckie” Dale (Jon Cryer), one of the most enduring and loved characters of teen movies of all time. Duckie is head over heels in love with Andie, but it is an unrequited love. Things get complicated when the dynamic is interrupted by the affections of Blane McDonough, a “richie”, and no-one’s friends approve of the unlikely union. Yes, the music is great. Yes, the movie is a cult favourite. Yes, the movie was named after a super cool Psychedelic Furs song. But what people never talk about is the pivotal role played by Ace the Dog. But the truth is that Ace would and does like it. And it’s interesting, because if you look through the indexes of any number of books on dogs or dog behaviour, you will almost never find an entry for “love”. Why are humans so afraid of talking about dogs and love? it seems a curious omission, because Humans could learn so much from dogs. Humans aren’t exceptional, you know, despite what they keep telling themselves. And this is where the fabulous John Hughes, the writer of Pretty in Pink, shows his genius. He introduces the wisdom of dog and love in the character of Ace the Dog, and for decades no-one even realised. Ace is there in the important scene when Duckie visits with Andie’s dad to declare his love for her. Ace sits quietly throughout while Duckie goes into various details about how he will lay the groundwork and win Andie’s affection. Andie’s dad gently and wisely tells Duckie that you can love someone, but that doesn’t mean they will love you back. And if they do, well that is just the most wonderful luck of all. Ace continues sitting, listening wisely, and then a dog barks somewhere off-screen. Neither human hears or acknowledges the dog, and I suspect even the audience doesn’t notice, but Ace briefly looks in the other dog’s direction, closes his mouth in earnest consideration, and sniffs. Ace lets us know that we should always acknowledge, ever so politely, the greeting of a friend. And then, later in the film, when Blane is succumbing to peer group pressure and gives Andie the cold shoulder, Andie has her brief heart to heart with Ace. Don’t fall in love, Ace, she says. But she misses the fact that Ace is already in love. Ace is the perfect foil to her doomed attempt to remain aloof. Andie looks Ace in the face, and Ace looks right back. And that is love. Dogs have a lot to teach humans about love. So let’s bridge that great divide. Let’s talk about love. Pingback: Greetings for Valentine’s Day! – Be That Dog!